(U//FOUO) Militia extremists are expanding their target sets to include Muslims and Islamic religious institutions in the United States. This has resulted in increased violent rhetoric and plotting and has the potential to lead, over the long term, to additional harassment of or violence against Muslims by domestic extremists. The FBI makes these assessments with high confidence on the basis of a large body of source reporting generated mainly since 2013. 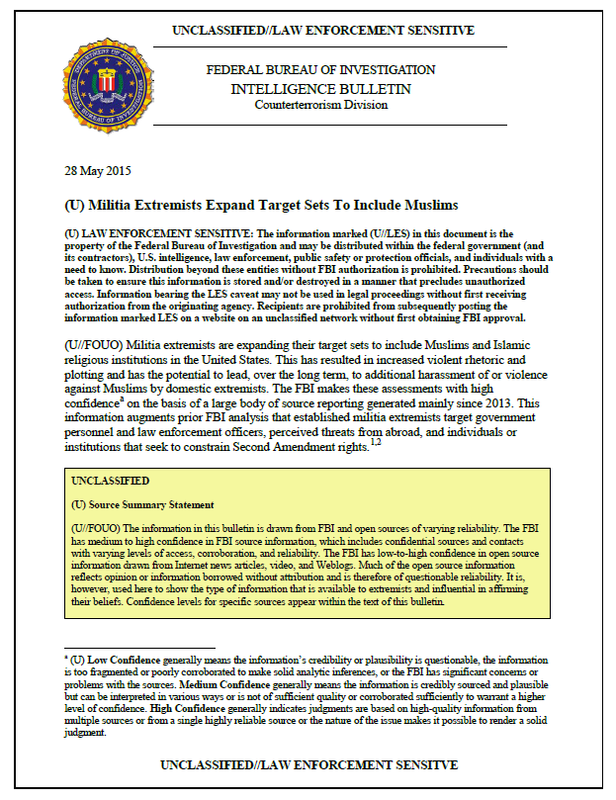 This information augments prior FBI analysis that established militia extremists target government personnel and law enforcement officers, perceived threats from abroad, and individuals or institutions that seek to constrain Second Amendment rights. (U//FOUO) The FBI assesses militia extremists, increasingly over the past two years, have conducted surveillance, plotted, and advocated violence against mosques and Islamic centers across the United States and specific Muslim communities. • (U//FOUO) Multiple sources with varying levels of access report conducting surveillance in diverse locations including Alaska, Arizona, Indiana, Montana, New York, North and South Carolina, Utah, and Texas. • (U//FOUO) A reliable source with good access to the information reported that a leader of a militia extremist group in the western United States expressed in early 2015, interest in training members for direct action against ISIS and associated ISIS locations. • (U//FOUO) In September 2014 militia extremists in Mississippi discussed kidnapping and beheading a Muslim and posting video of the attack to the Internet, according to reliable sources with good access to the information. The group has, however, since disbanded. • (U//FOUO) A militia extremist posted calls over social media to kill Muslims attending worship services and during a public event in 2013, according to a reliable source with direct access to the information. • (U//FOUO) Islam represents a foreign threat, equivalent to those which emanate from illegal immigration or international terrorism. • (U//FOUO) The President of the United States not only sympathizes with Islamic extremists but directs US Government policy to align with their goals. (U//FOUO)The FBI assesses various claims the US government allows the group Muslims of the Americas (aka Jamaat ul Fuqra, hereinafter referred to as MOA) to operate terrorist training camps at dozens of locations across the United States resonate with adherents of a militia ideology who seek validation of anti-government conspiracy theories. These assertions— repeated over the course of a decade by self-appointed watchdogs of Islamic extremism, Internet bloggers, and some news media–are based in part on official government information which bolsters claims the US Government chooses to ignore the camps. Accusations about the camps periodically surge, most recently in the wake of the 7 January 2015 terrorist attack against the French magazine Charlie Hebdo. (U//FOUO) Militia extremists will likely continue to identify and discuss potential Muslim targets, should the level of concern generally about Islamic terrorism remain at current levels. The FBI further assesses primary target choices will continue to include locations easiest to access, such as local mosques or religious institutions, followed by locations portrayed by Internet sources as having threat potential, including MOA enclaves. Militia supporters also will likely continue to conduct surveillance of targets as they are identified. FBI confidence in these assessments is medium on the basis of current intelligence. (U//FOUO) Assuming no new incidents or high profile controversies relating to Islam or Islamic extremism raise domestic extremist intent levels, the likelihood domestic extremists will harass or commit violence against Muslims or religious institutions is low. This assessment is made with low confidence, as domestic lone actors and small cells possess varied capability to attack Muslim targets. Successful acquisition of resources and detailed planning raise capability levels and, combined with heightened intent, likelihood of violence.